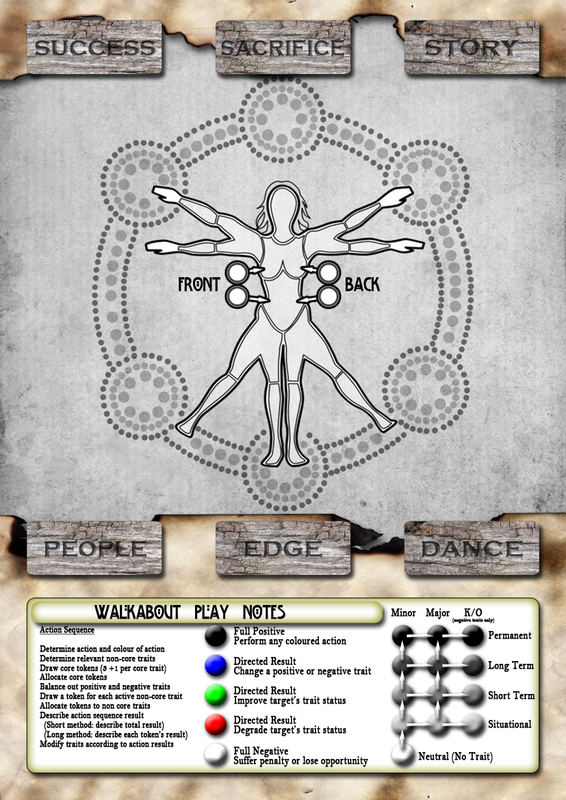 In a game of Walkabout, the Oracle begins with an imbalance in the spiritual energies of the world. The imbalance cascades out, causing conflict in the local environment, arguments between people, tainted crops, lost things slipping through cracks in reality, mutations, insanity, and all manner of surreal effects. Each of these effects manifest as scenes to be investigated by the heroic wandering post-apocalyptic shamans known as the Wayfarers. 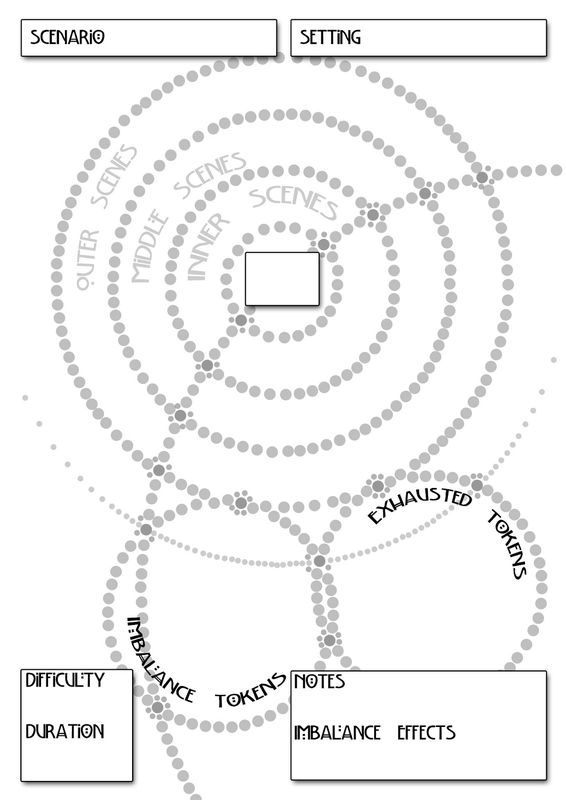 This play sheet is used by the Oracle to lay out the scenes, to determine how they relate to one another, and how they ripple out from the central disharmony. The first batch of Walkabout Pocketmods are now available. They haven't been made pretty, they're just raw things that can be used as playtesting aids for anyone who might be interested in putting the game through its paces before I take it further. The current set consist of a basic players guide, a basic GM/Oracle's guide and a trio of play booklets (one for characters/wayfarers, one for the settlements that wayfarers encounter, and one for spirits). Shortly, I'll be adding a few more to this collection (a play booklet for survivors, and a booklet of flowcharts to explain the game mechanisms in a more visual manner). There will be a few starter booklets with some wayfarers, survivors, spirits and settlements. Also a few full page scenario charts and note sheets to get a few game ideas under way. While I'm thinking about Walkabout inspirations, I've been trying to think of some unconventional post apocalyptic vehicles. 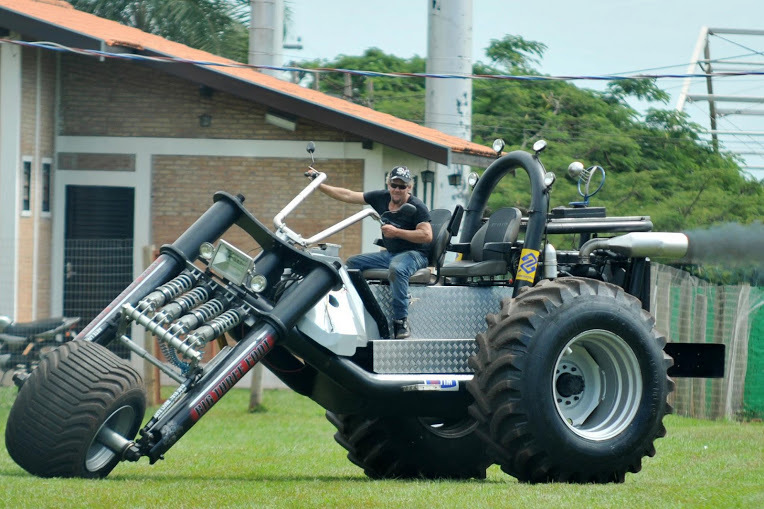 Not the usual battered all-terrain vehicles from "Mad Max", but those will certainly play a part in the setting. I'm trying to think of a few vehicle ideas that will be really memorable for flying across the Australian bush and the cracked highways between battered settlements. Here's a few of the inspirations I've found over the past couple of months. I've got the first big test of Walkabout on it's way...it has had a few small tests so far, but this is the first big public exposure. Under a month away, it will be seeing a convention audience at Canberra's annual "Phenomenon" convention. So, when I found a ruined warehouse near my university, I naturally had to take some atmospheric shots to get in the mood. Probably not quite ruined enough, but I don't have an apocalypse and a hundred years to wait for some real photos. I'll add a few changes to these, maybe adding some spirits, monsters or suitably post apocalyptic folks, then photoshop these up (or instagram them) to make them look old and worn, then these will make some good additions to the game art. I love the idea of game chef...I get all enthusiastic about pushing my design mind in new directions, but more often than not real life gets in the way and I just don't get the chance to refine my ideas. Oh well, back to other projects. If time is like a river, flowing from one point to another inevitably from the start of creation to the end, then everything in reality is just flotsam and jetsam caught in the current. Every element of reality swirls into contact with other elements at one moment, perhaps remaining linked for the briefest of nanoseconds, or maybe attached for endless millennia, but eventually a time comes when the currents of time whisked elements away from one another. Somewhere between order and chaos, reality shifts according to the flow of time, the only inviolate constant. Except there are those of us who violate even time itself. We plunge into the flowing currents of the time-stream when it suits our convenience, or when ordered by the voices beyond the void; we make changes, corrections, improvements. Yet we must never make connections to those stuck within the temporal currents, lest we get caught in its swirling eddies and entropies. The game I'm tinkering on for game chef is about jumping into a time-stream and correcting reality. It's just struck me....without too many spoilers, it's probably due to watching the season finale for the most recent Doctor Who series. Since there are fixed points in time and space throughout the game..immutable facts that must occur, then why not run the whole narrative like that. Lots of people like to pick plot holes in movies...a great many plot holes come into the story because the movie needs to be cut down to a manageable viewing time of 2 to 2.5 hours. The story is in place in the background, but to keep pacing in place, certain bits are omitted (even if they make other parts of the story make sense). Sometimes it's just bad writing. If we take a big budget sci-fi movie...the plot holes are often huge, and things get dropped in order for the special effects to shine through. I thought I had "Town Guard" ready to go, but final attempts to publish have led to a few glitches. Busy working to overcome them now. A bit fantasy, a bit "law and order", and a bit heraldic. Getting pretty close to what I originally envisioned. How do you run a game where the characters exist outside of time and space? How do you reflect abilities when reality itself is malleable? Is it possible to simulate difficulties for tasks when reality can be bent to your whim? The RPG Amber dealt with things like this quite simply, Mage: the Ascension did some work in a similar area. Perhaps the easiest way to deal with variance between characters in this sort of setting is to give them spheres of influence. Are you a god of thunder? Does manipulation of the weather provide an advantage in this situation? If so, and you can suitably justify it, gain a bonus. If not, sorry, try something else. I've been thinking of the Dragon Die in the Dragon Age RPG. You roll a bunch of dice and determine the total, but if the dragon die matches one of the other dice you gain bonus points for manoeuvres that change the way the action plays out. How about a system with two dice like this? If the "And" die matches one of the others in the test, then regardless of the success or failure of the action something beneficial occurs. If the "But" die matches one of the others in the test, then regardless of the success or failure of the action something detrimental occurs. If both of these dice match in some way, then some truly interesting outcomes occur. I keep coming back to them. Weeping Angels from Doctor Who...no, but that might be something to consider further down the track. But Doctor Who (the current series) has certainly informed some of the concepts I'm considering. I'm thinking of a game with fixed immutable events in the timestream. Our angels are more akin to troubleshooters from the game Paranoia. Something has twisted the timestream to give a huge advantage to a power that opposes our troubleshooters/angels/immortals/bodhisattvas. A segment of the timestream is ripped out so they can go in and fix it. They have 48 hours, but they can't cross their own timestream. Any segment of the 48 hours that is used becomes a segment they can never enter again. Every action they undertake in the timestream becomes an immutable fact within the timestream...but they can change events before or after those facts to alter the specific meaning of the events they have already undertaken. Time may be linear, we may perceive ourselves to be caught in an existence trap with only asingle direction forward and the memories of the past behind us, but are we simply blind to more possibilities. This is a game about mages, super heroes, mutants, taoists who have reached alchemical enlightenment. They exist beyond the timestream, and through their power they can change much of reality...not all of it, but enough to either keep things running smoothly, or enough to cause problems for their enemies. (head with "snowflake"/"fractal thougts") Some have the ability to change the way people think about things, they can implant seeds of thought in people's minds, or transform memories. (apple with worm) Some have the power to transform the material existence around them, creating life with a thought, perthaps even manipulating at a molecular, atomic or quantum level. I tick ever closer to 4000 downloads for my game FUBAR (many on RPGNow, plenty on 1km1kt, a decent number through my own website when it was active). With that many ephemeral copies of the game floating around, I would have expected more responses from players across the world. I've had a few, but not many. I can only imagine that a lot of people have looked at it and have said "Nice, but this is a monster to print out". So it's sat on their computers, maybe used as inspiration for ideas to integrate into other games. Perhaps it needs a physical copy to make the transition from "interesting but academic text" to "awesome gaming action". But I certainly can't afford a print run at the moment, especially not the print run FUBAR deserves. So, I'm thinking of taking the crowdfunding route. Well, it looks like the site is having trouble loading...maybe there's a whole heap of designers ready to start the ten day frenzy. Maybe it's just my slow Internet connection. I've only got one more file to upload for Town Guard, and then the game will be made available for sale on The Game Crafter (if everything goes according to plan). It's been a fun experience designing a boardgame rather than an RPG. Hopefully those people who were interested in the game will be willing to spend a little money to buy a copy of it, (especially those who were interested but didn't want to cut out dozens of cards, hexes and tokens). If three or four people buy a copy, I'll have enough profits to buy a hardcopy for myself. I'm still considering this an open beat for the game...anything could be improved. I know "every dungeon has a difference"...that's what everyone says about their dungeons. But here's one I'm working on. Generations ago, something hot fell out of the sky, burning a huge shaft into the ground. Halfway down the hole it left, there are thick oily mists. Sometimes the sun shines at the right angle to burn away some of the mist. On those days there is a structure visible at the bottom of the hole. The structure has great cylindrical chimneys that burn with red heat, constantly churning off more of the noxious fumes and mists that fill the middle layers of the hole. Trying to climb down the central shaft is nearly impossible. The stone walls have long ago been melted into a hard glassy obsidian, and those who do make the climb are often picked off by monstrous bird-like creatures that perch in the few cracks. I've been thinking a bit more about the Review of Heroine. Each companion is good at something, but each also has a void that can only be filled by the actions of the Heroine. I know that I've been guilty of this in my illustrations. I guess I just didn't consider the ramifications. I just wanted women who looked ready for battle rather than girt in a loincloth and chainmail bikini. I'll certainly be considering this in future. A few quick points before we start getting into some details. Heroine sits squarely in the camp of games that are typically known as ‘Story Games’ rather than ‘Role-Playing Games’. Its sixty pages contain far richer instructions for storytelling and narrative based play than most “Dungeonmaster guides” or “GM guides” contain in two or three times as many pages. I’m in a real dilemma about adding dice to the town guard game. They make a cheaper option, but dramatically change the nature of the game. With this in mind, I’m looking to create a mechanism that alters the game as little as possible, but could be used as a touchstone for flavoured expansion sets in the future. 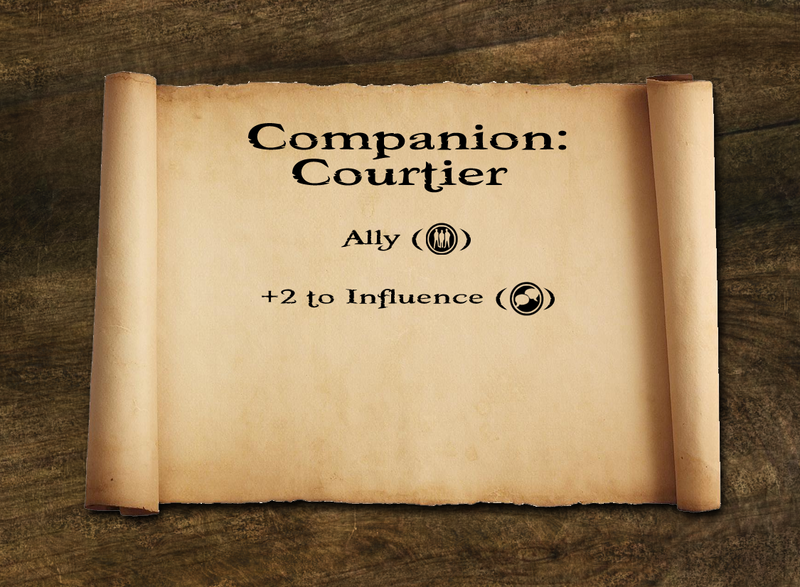 The simplest option would allow a player to add the roll of a die to their attribute total when confronting a mission. Increasing the difficulty of all missions by 3 would offset this. I've been uploading all the files for Town Guard and have found that I need to remove a few of the cards in order to get the cost price below $30 for the contest it's a part of. That's thrown an annoying glitch into the works because the only cards I was able to remove from the game were mischief cards or rewards. This now means that the set-up has lost some of the fun dynamic where players can interact with the stories of other guards. But it's dropped the cost price down to a level where I might be able to include a die in the box. Now, I'm questioning whether to change the core resolution mechanism from one that relies purely on card play, toward one that has a random element injected by the die. At least with randomness, players can blame the dice when they lose. Generally comments on the location tiles have been positive. But much of the critique has focused on the way the centre of the tile is obscured by the ghosted hexagon. I'd love to put the relevant game play information around the outside edges of the location tile, but I'm not sure how good the cutting tolerances are when these parts are produced. I'd much rather have the background image obscured in some way rather than have useful play information cut away from the piece. I've also been toying with the way the locations play into the wider game. 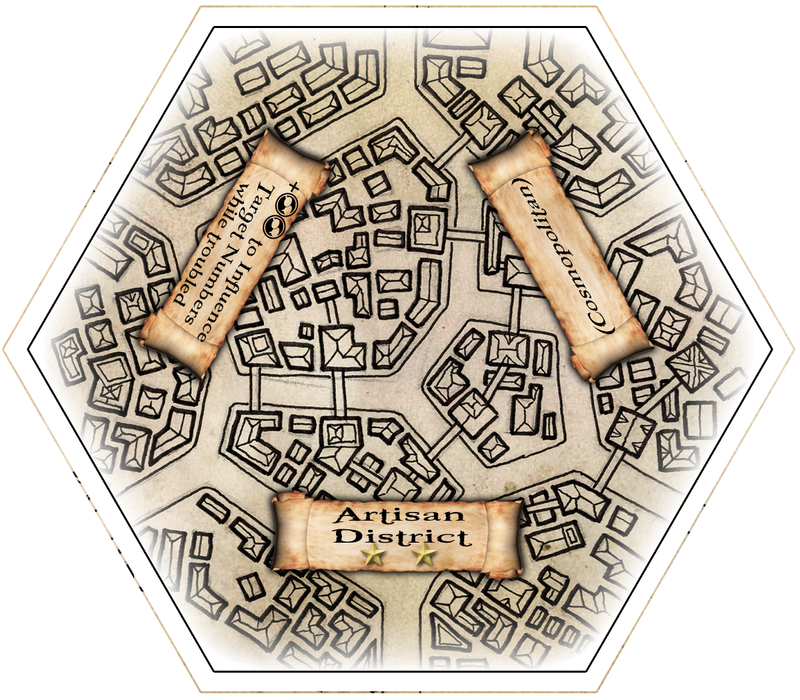 Now, if a location is troubled by an unresolved mission, all missions across the town are impacted by the modifier on the location. It gives the variation in locations variation a bigger impact on play this way. It's been pointed out that the cards I've produced for Town Guard have writing that's too small to read across the table. It's also been pointed out that the icons used throughout the game are cool, but probably a bit small to be read as anything other than black circles with white swirls and squiggles in the middle of them. With this in mind I'm probably going to be changing the card layout a bit. The first batch of cards that I'm looking at changing are the reward cards, because these now have an additional effect within the game (they help escalate things so that it's possible for the town's criminals to win, and thus for all of the town guards to lose). This comes through the number of the lower centre of the card.